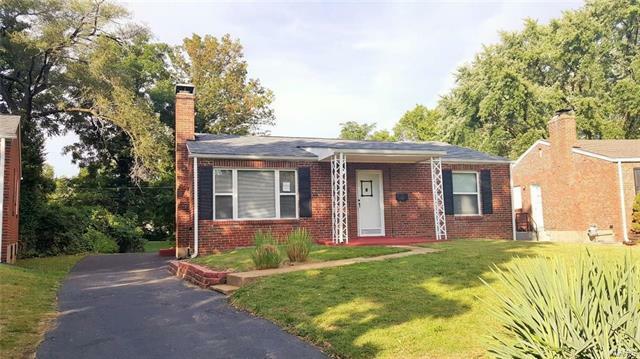 UPDATED, UPDATED, full brick home w/front covered porch. Step into the living room and see the cozy wood burning fireplace with red brick & decorative white surround and new carpet through-out the home. There is a large dining room and the kitchen boasts pantry, new countertops, gleaming black gas stove, dishwasher, refrigerator plus tile backsplash, new ceramic tile flooring and hardware knobs. Updated bathroom vanity, new elongated toilet with 2 flush settings and you will love the tile shower/tub surround with new controls. Nice-sized bedrooms one with a built-in desk, dresser, cabinets plus a closet in that room too. Home has lots of updates: 6 panel doors, fresh paint, lighting, main electrical panel, water heat, HVAC and windows. Bright clean basement has a cedar closet. Off street driveway, great level backyard backs to common area and the path for Mona Trail. A MUST SEE move-in ready home that won’t last long! Delmar Ave to North on North & South to West/Left on Blackberry Ave to North/Right on Blackberry Place. Ahern Ave will be the 3rd street on your right.